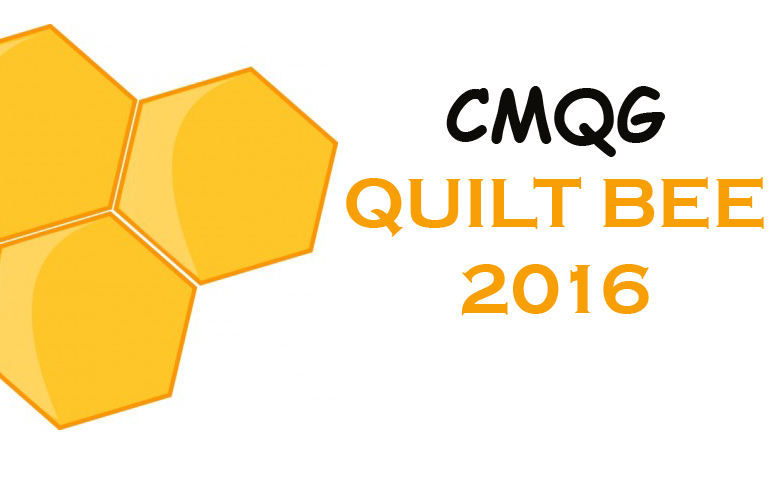 Cincinnati Modern Quilt Guild: Our QuiltCon Charity Quilt! 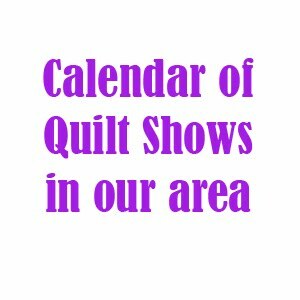 Did you know that our guild will be represented with a quilt at QuiltCon? I'm so excited with how this quilt turned out! 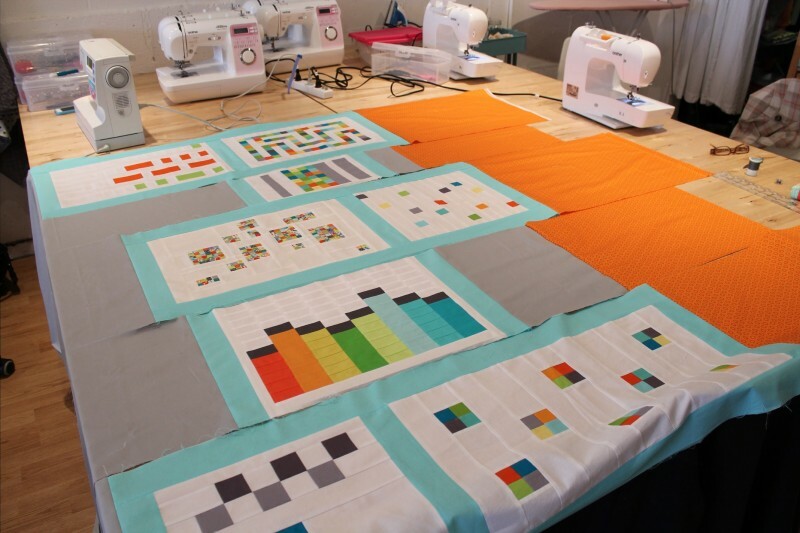 The challenge we had was to take 8 of the QuiltCon challenge blocks that people entered to be in the winning quilt but didn't make it, and turn those into a large twin. We were sent blocks that all had a small square theme and they were fabulous. We really wanted to do something that highlighted the blocks, so Cass had the idea of arranging them into a hopscotch-like formation. Perfect! Julie from Sewn Studio was nice enough to let us spread out to work in their wonderful sewing space. It was great being there to get all the extra fabrics we needed. Michelle had already taken the blocks home to border them in Moda Bella Robin's Egg Blue. Then Nancy, Amanda and I worked to finish the top off by adding a background of Bella Silver and some bright orange Oval Elements by Art Gallery. This big table was really helpful in letting us line up all those big strips. After a couple of hours, we had the top done, binding made, and backing cut so that we could hand it all off to Cass for quilting. At this time, I think there was only about a week before the quilts were due in Austin- we were cutting it close! But she really delivered so beautifully. Cass did so much work on this! I'm so proud that this how the CMQG will be represented in Austin. Here is a shot of the back. It's mostly a print from Jay McCarroll's Center City line, along with some scraps and more Robin's Egg Blue. 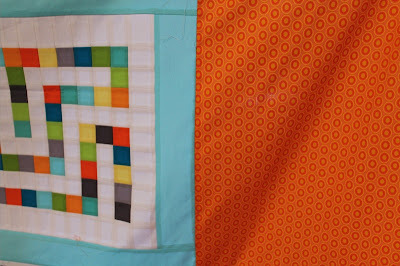 The binding is also from Center City and picks up all the colors of the quilt perfectly. Thanks again to Sewn for the discounted fabric and work space. 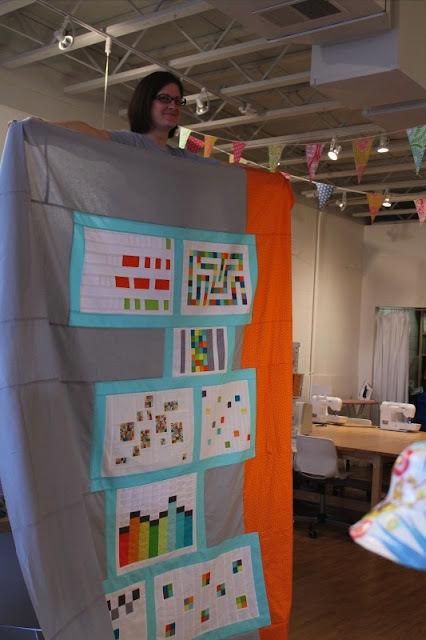 The quilt is already there in Austin, so unfortunately we can't show it to the guild in person. After the show at QuiltCon, it will be donated to the Austin Children's Shelter. Thank you to everyone who helped make this happen! 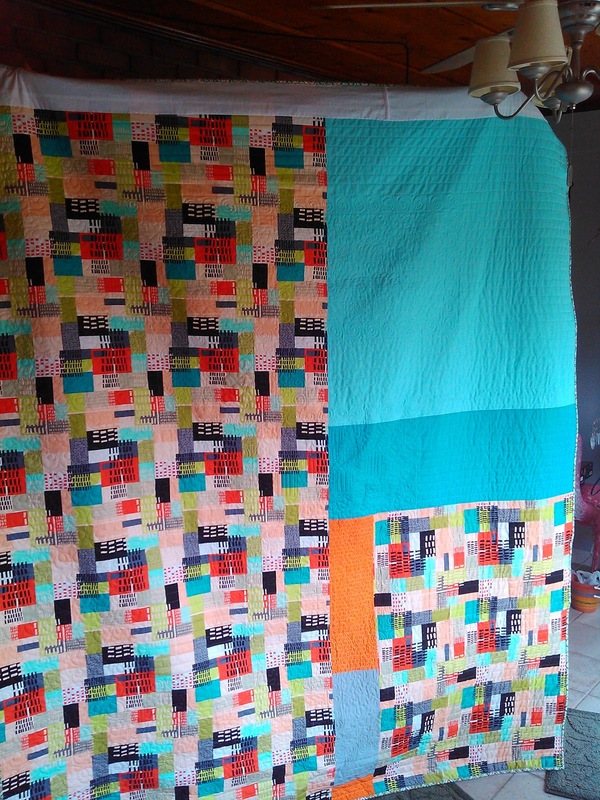 Cass, the quilting is beautiful! 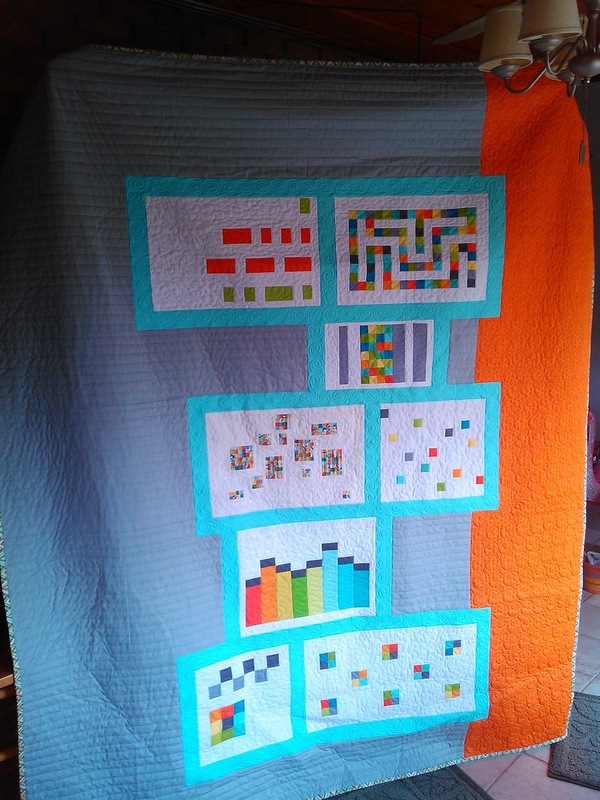 Someone is going to be very happy to have this quilt.